April, the between-seasons month—too warm for winter sports, but still too cold for summer activities. But never fear, there’s lots to do in April to take your mind off the temperamental weather. Poutine is a big draw on both sides of the river. In Gatineau, Place de la Cité welcomes the first Gatineau Beer and Poutine Festival. A dozen food trucks will be on site, serving up different variations on the poutine theme, and several craft brewers will be offering liquid refreshment to accompany your meal. Entertainment, kids’ activities, live shows … it’s all lined up for a poutine-tasting adventure with family or friends! On the Ottawa side, the PoutineFest takes over Sparks Street from April 26 to 29. It’s finger-licking good! The party continues in Ottawa at the PoutineFest on Sparks Street. To mark International Women’s Day, the Centre d’action culturelle de la MRC de Papineau is organizing FemmExpo, an exhibition of works by 39 local women artists. This 10th anniversary edition of FemmExpo, on the theme Pouvoir autrement, presents a women’s-eye view of current events. An intriguing and thought-provoking artistic experience. Do you wish you could have spent more time at the Salon du livre de l’Outaouais last month? Catch up at the Fête du livre en famille (Family Book Fair), where several local children’s authors will be present. Take advantage of this opportunity to share the love of reading with your children. The Women’s Show is coming to the Outaouais. Now in its 12th year, this major trade show features more than 220 exhibitors and more than 75 presenters on such topics as health, well-being, meditation, beauty and grooming, and many more. Admission is valid for both days of the show. Love to dance? Head for Joe Rocca (Dead Obies)’s show at the Minotaure. Blending pop, R&B and hip hop, his new album French Kiss reveals a new side of this popular music artist. Reserved for ages 18 and over. Cash-only bar on site. Discover fascinating fossils from across Canada at the national touring exhibition Museums’ Choice: Fossil Favourites from Across Canada. From British Columbia to Nova Scotia to the High Arctic, explore the rich diversity of our land. Everyone loves visiting a maple sugar shack, so Le Rituel created the Urban Sugar Shack. Not too sure about that? Have a look at the menu (in French only) and you’ll soon be convinced! The Urban Sugar Shack also serves dinner on Fridays and Saturdays starting at 5 p.m. Price $41 (children 12 and under $13). Vegetarian options available. 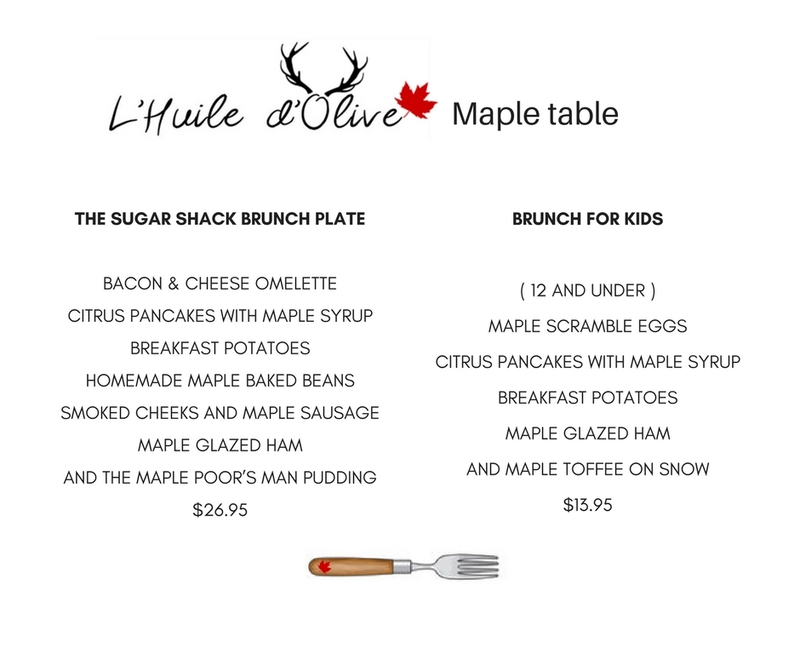 Treat yourself and your sweet tooth to the sugar shack brunch plate at L’Huile d’Olive restaurant. Hearty and satisfying! When night falls, many different animals awake and become active. Join an experienced birdwatcher for an evening Owl Prowl. Discover the many owls that live in Gatineau Park, and learn about their unique characteristics and behaviours. April 7 at 7 p.m.
Harmonize with nature! Rediscover the power of sound, from whale songs to karaoke, at the Nature Nocturne: Harmony themed evening. Entertainment, music and dancing. April 27 at 8 p.m. Reserved for ages 19 and over. Cash-only bar on site.